For more than 130 years, Martin Estate’s majestic stone château has graced the Eastern benchland of the Rutherford appellation. Privately owned, the property encompasses twelve acres and is one of the oldest historic estates in the Napa Valley. The complete winemaking process occurs exclusively at the château, permitting the utmost control and attention to detail. Each grape cluster is handpicked, before being hand-sorted to the single berry. Very limited availability due to the private nature of the Estate. No group tours and tastings. Not available for events. To join the wine club, visit www.martinestate.com or call 707.967.0300. 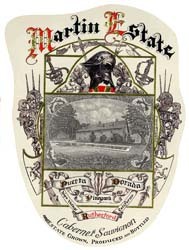 MARTIN ESTATE COLLECTOR'S CLUB Members receive a guaranteed allocation twice per year. Please contact Greta@MartinEstate.com for membership availability.